Rogue X Irons are a total distance overhaul, with our 360 Face Cup and VFT, multi-material construction, Urethane Microspheres, and a component package designed for maximum distance. 360 Face Cup and VFT: Rogue irons combine our renowned 360 Face Cup technology with Variable Face Thickness (VFT) technology to expand the portion of the face that delivers fast ball speed. Face Cup employs a shallow, flexible rim around the perimeter of the face that flexes and releases at impact to increase ball speed. VFT also influences how the face itself flexes to promote more ball speed on off-center hits. The combination of these two technologies promotes ball speed and distance. Rogue Irons are the best combination of distance, accuracy and playability ever in a Callaway iron with our 360 Face Cup and VFT, multi-material construction, and Urethane Microspheres. 360 Face Cup and VFT: Rogue irons combine our renowned 360 Face Cup technology with Variable Face Thickness (VFT) technology to expand the portion of the face that delivers fast ball speed. Face Cup employs a shallow, flexible rim around the perimeter of the face that flexes and releases at impact to increase ball speed. VFT also influences how the face itself flexes to promote more ball speed on off-center hits. The combination of these two technologies promotes ball speed and distance. 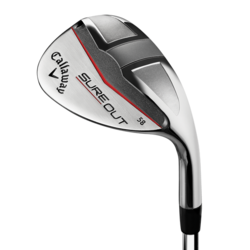 With the Sure Out Wedge, renowned golf instructor Hank Haney has collaborated with Callaway engineers to create a new wedge that makes greenside shots – especially from sand and rough – incredibly easy to play. East Explosions from Greenside Bunkers: New enhanced-camber, high-bounce Sure Out sole glides cleanly through sand without the need to open the face at address, generating easy, high, soft-landing shots. Solid Contact for Consistent Distance Control: A wider sole and larger face area promote solid face-to-ball contact for optimal distance control. 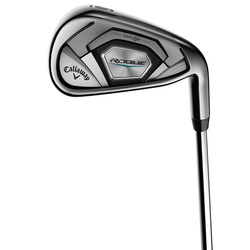 Rogue Pro Irons are the best combination of distance, accuracy and playability ever in a Callaway players iron. 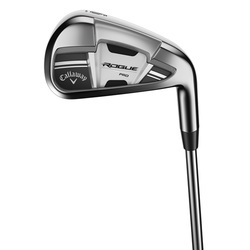 Rogue Pro Performance Package: Caters to the preferences of better players with a compact head, thin topline, thin sole, shallow cavity and minimal offset, to increase workability, trajectory control and impact feedback. And the lofts are slightly weaker than Rogue Standard. 360 Face Cup and VFT: Rogue Pro irons combine our renowned 360 Face Cup technology with Variable Face Thickness (VFT) technology to expand the portion of the face that delivers fast ball speed. Face Cup employs a shallow, flexible rim around the perimeter of the face that flexes and releases at impact to increase ball speed. VFT also influences how the face itself flexes to promote more ball speed on off-center hits. The combination of these two technologies promotes ball speed and distance. Mack Daddy 4 is the new standard in wedge performance, led by our innovative new groove-in-groove technology for more spin. More Spin from Groove-in-Groove Technology: A unique suite of features and technologies promotes enhanced spin and control. 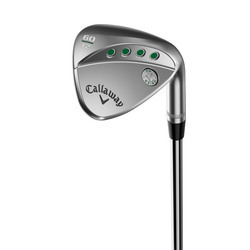 20D Groove: The lower lofted wedges (52 and below) feature a 20D groove for consistent spin on fuller shots. 5D Groove: The higher lofted wedges (54 and above) have an aggressive 5D groove for maximum control out of rough and around the green. 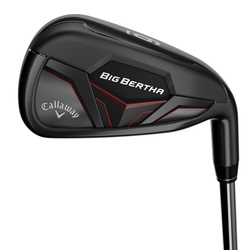 The new Big Bertha has transformed the super game-improvement iron category. It’s our easiest to launch distance iron, and it’s led by our groundbreaking Suspended Energy Core. Easy Launch, Distance, and Incredible Sound and Feel from the Suspended Energy Core: The Suspended Energy Core is the engine of the new Big Bertha irons. This revolutionary new construction suspends the MIM’d Tungsten weight using our proprietary urethane microspheres. It’s designed to deliver easy launch; long consistent distance; and incredible sound and feel. 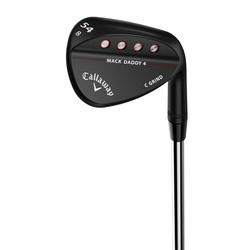 A unique, high-performance wedge design from Phil Mickelson and Roger Cleveland. Offset Groove-in-Groove Technology for High Spin Lob & Pitch Shots: Positioning the micro-grooves on a 20° angle in relation to the standard grooves promotes added spin on chips, pitches and lobs. Increased Offset & Higher Toe for Crisp, Flag-finding Knockdown Shots: Increased offset and higher center of gravity from the higher toe together help players control trajectory on full and partial shots. 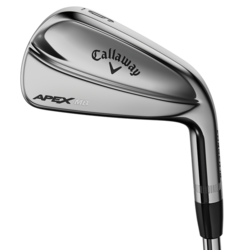 Callaway Apex Muscleback Irons are true musclebacks inspired by the Tour and suited for the best of the best players. Tour Shaping and Design: The world’s best players provided extensive feedback to help make this a true muscleback iron. This is a classic shape and style, with a traditional, slightly thinner topline, and a beautiful bright chrome finish in our smallest blade head shape. And we’ve advanced our CG positioning to optimize the CG for outstanding control. High Performance 20V Grooves: Precision grooves are built in to promote the high level of control and consistent spin that muscleback players expect out of any playing conditions. 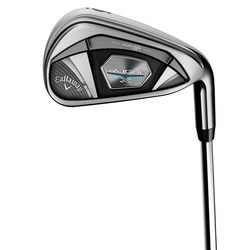 The 20V grooves also stand out for reducing fliers from the rough to deliver even more control. 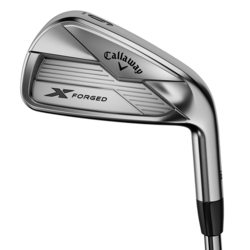 Callaway X Forged Irons are designed based on extensive feedback from Tour players, featuring forged performance, precision shot-making, and a classic finish. Exceptional Feel and Control: Extremely precise triple net forging for exceptional feel and high performance. The Tour configured soles are designed for excellent turf interaction from a variety of lies. Precision Grooves and CG Progression: The 20V grooves are built in to promote a high level of control and excellent spin out of any playing conditions. They also reduce fliers from the rough, and the CG locations are optimized for even more control.